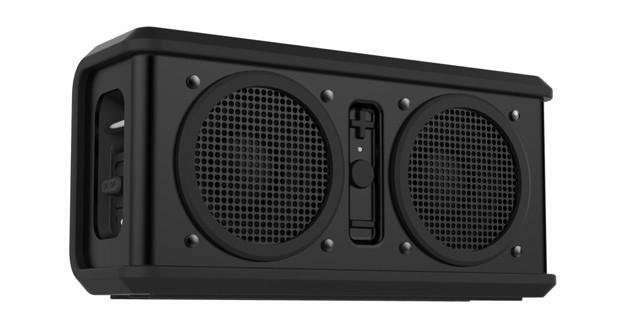 Skullcandy has just released their new Air Raid Bluetooth speaker. The Air Raid has been designed for wireless listening of music provided through Bluetooth devices such as tablets and smartphones. Skullcandy has developed the new product to be durable and be the loudest playing speaker of its type. Within the single enclosure are mouted two 50mm drivers that are driven by an internal amplifier that generates 5-watts /channel, producing 88dB SPL. On the durability side, Skullcandy claims that the Air Raid is waterproof, and impact resistant. It sports a stainless steel faceplate and removable silicone boot. Air Raid has a 14 hr playing time at mid volume, 10 hours at mid to high volume and 5 hours at its maximum output. Checking battery life is as easy as a double press to the center button that will reveal a green LED if all is good to go. Two Bluetooth-enabled devices can simultaneously connect to a single Air Raid for easy switching back and fourth between sources via button on the front face. The Skullcandy Air Raid is currently available at a MSRP of 149.99 U.S. Look for more details at: www.skullcandy.com.